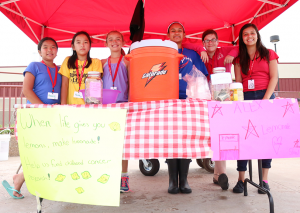 Rachel Vu, 11, Faith Tran, 11, Alexandra Butler, 11, Esmeralda Garcia, 13, Madeline Angiel, 13, and Iliana Silva, 13, sell lemonade at Alex’s Lemonade Stand near the entrance to OCCC’s SEM center on July 9. On July 9, College for Kids Giving Back class raised $1,057.63 for childhood cancer research by hosting Alex’s Lemonade Stand on OCCC’s main campus and at the FACE Center. 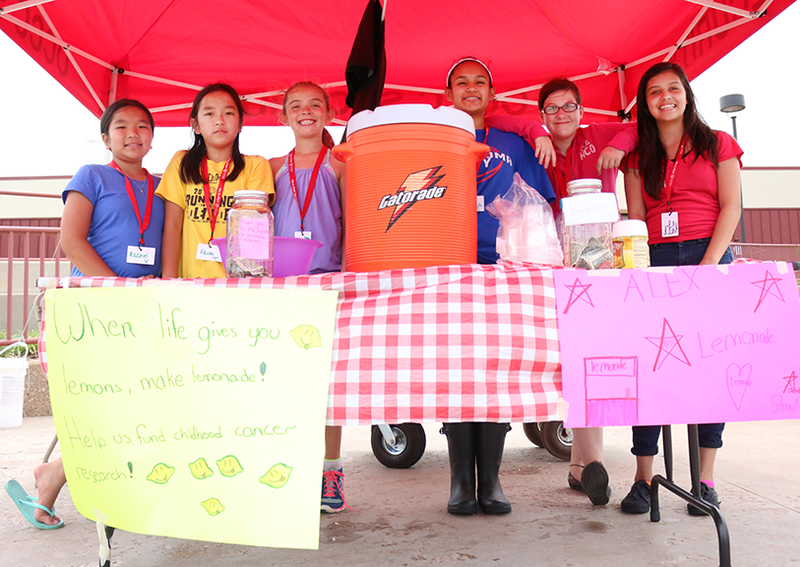 Selling cups of pink lemonade gave kids the opportunity to make a difference in the lives of other children. “I think it’s important because we’re helping people — that we can give them a longer life, give them more research,” said 13 year-old Iliana Silva. Rachel Vu, 11, shared the background of Alex’s Lemonade Stand, a foundation that has reached beyond its founder’s lifetime. According to their website, Alex’s Lemonade Stand Foundation (ALSF) began when Alex, diagnosed with neuroblastoma before her first birthday, set up a lemonade stand to fund cancer research. She raised more than $2,000 in one day. By the time Alex died in 2004 at the age of 8, she had raised more then $1 million for the foundation. Since 2008, ALSF’s travel fund has provided more than 400 flights, 2,800 nights of lodging and 17,000 gas cards to families in need during their child’s cancer battle. The foundation also has raised more than $100 million for research as well as funded more than 500 research projects at 100 institutions. For more information on setting up an Alex’s Lemonade Stand or to make a donation, visit www.alexslemonade.org. For more about College for Kids, visit http://www.occc.edu/coe/college4kids.html.